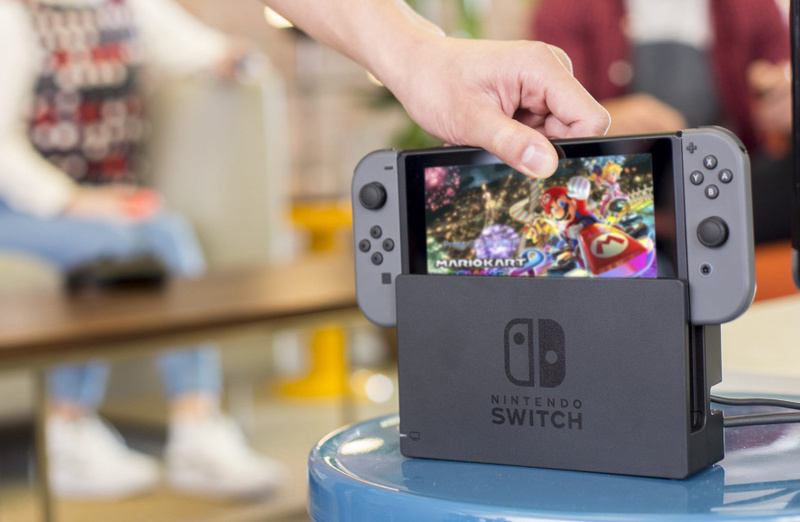 "We'll continue to see the strong software slate"
The Switch's first year on sale has been incredible, thanks a flood of amazing games like Zelda: Breath of the Wild, Splatoon 2 and Super Mario Odyssey. Even the most optimistic Nintendo fan will admit that 2018 is, by comparison, looking somewhat bare, but GameStop CEO Mike K. Mauler nevertheless thinks it's going to go down as a strong 12 months. We know what happened with the Wii U. I'd say this is definitely a whole different platform that we saw in the past. We have visibility to the software... So, last year was a tremendous year for their software as well as hardware, between Zelda and Mario Odyssey and all the games that they had, it really drove a lot of hardware sales as well as software. I think, this year, when we look at the slate of titles -- many of which haven't been announced yet -- this year looks also very, very strong. So, I think, at least for 2018, we'll continue to see the strong software slate drive additional install based on the hardware and increase attach rate. We don't have, really, visibility for '19 yet, but for '18, it should play out that way. So what unannounced projects could Mauler be referring to? We'll no doubt get to see later this year during E3, but feel free to let us know your predictions by posting a comment. I keep reading his comment and from his words it doesn’t seem to me like he personally knows any of the unannounced titles. He is simply postulating that Nintendo will announce more games, which is obviously the case. Let’s just hope it’s not a bunch of additional Wii U ports. That said, I do agree that Nintendo is finally relevant again and the Switch has been a runaway success. I’m just a little disappointed that in the first half of the year Nintendo is only releasing two brand new first party retail games (Kirby and Mario Tennis). Here’s hoping they fix that for the latter half of the year. I'm glad someone is talking on behalf of Nintendo! Pokemon 2018, Mario Party 11, F-Zero Resurrection, Punch-out!! the New Generation, Startropics III Return to Paradise, Story of Seasons the big one, Animal Crossing: Ultra Festival, Pikmin 4, and the long awaited Starfox 64-2. Edit: and Spyro Trilogy. Lol. Well there you go, whi... erm, I mean needlessly negative people. As great as Nintendo is doing right now, does anybody else miss the regular Miyamoto, Iwata, Reggie updates? Or just seeing them mucking about. I'm just not crazy about the new guys is all. And Nintendo feels a bit emotionless. NEW F-ZERO PLEASE (or just remaster GX w/online). Nintendo, it’s time! @KingdomHeartsFan No need for the "not trying to troll" disclaimer, unlike the idiot above you, since you're obviously sincere, and I think it's safe to say that most of us real Nintendo fans also miss these people and their presentations, so completely agreed. For other people still reading this: I'm not calling myself and idiot, obviously. That person has since been removed by the mods, and rightfully so. Eh, I dunno, kinda sounds like a speech tailored just to make people go (preferably to Gamestop) and buy Switches. Of course there are unannounced titles and convention/expo season is taking off. And i will Happily "Eliminate" my PS4 entirely, even i have owned PS4 Slim White now. I honestly don't think he has any visibility other than what's in the public domain. @thesilverbrick I don't know. I think when he says "we have visibility to the software", he means that he knows what games Nintendo tentatively plans to release for 2018. Whether those games will actually come out in 2018 is another question entirely. Well I am pretty psyched already for that games that have been announced, so for me, this year already looks like a success. Can’t wait to see what else Nintendo has in store. Still holding out hope for a Luigi’s Mansion on Switch, Kingdom Hearts HD collection & Fortnite. PS: I’m also very interested to see how Labo sells. I have a feeling it will be extremely well for Nintendo this year. Remember when there are some Pending Switch games for 2018, like My Time at Portia, Re:Legend, AOV, Penguin Wars, etc ? I'm sure they will be announced soon. Even if GameStop's CEO doesn't know the unannounced titles, it's likely Nintendo has given him information on how many physical titles are expected to ship, along with pricing, and also he'd likely be able to see what 3rd parties are shipping Switch games. I think it's safe to say that Smash won't be the only tentpole release this year. I just wonder if Game Freak can finish Pokemon in time, or if Nintendo will opt for other title. @KingdomHeartsFan I'll say one thing; I really miss Iwata. It really does feel like he brought the life at Nintendo. Shame he had to go so soon. It's an interesting time for sure. Nintendo is being super, super secretive about everything ever since we first heard about the Switch. I think they'll have a good lineup in the second half of the year. We know we have Smash, Fire Emblem and Yoshi (as long as none of them are delayed) which is already a good place to start. Then, just imagine the roaring sales if a Pokemon game comes this year. But I hear you, it would be nice to know what the plan is. Fortnite / PUBG announcement would help things surely? Given that the mobile versions run so well but they are not offering controller support on them. Switch plugs that gap perfectly. @SmaggTheSmug This is exactly what I thought too. The thing is though, they didn't even want to acknowledge the Wii U existed at this point. Even if they are the scummiest of companies, at least the are pushing Nintendo now. @KingdomHeartsFan, I agree I definitely miss Iwata San's Nintendo Directs I do however also like the new guy that clicks his fingers though I'm not sure what his name is. Iwata left some big shoes to fill . I think we will get the new Pokemon this year, a new 2D Mario plateformer, new Donkey Kong Country, let us not forget that Smash Bros. is coming this year and it will be phenomenal and personally I would love to see a new Kid Icarus on the Nintendo Switch maybe Metroid Prime 4 which would be amazing or a new Animal Crossing I am definitely looking forward to E3 this year . Super Mario, Mario Kart and Zelda were released in the first year. The rest of the remaining Switch years can never compete with the first year. The 3 biggest Nintendo games were already out. My pet goat knows more about video games than that CEO. I suspect I'm in the minority but I don't miss that era of Nintendo. To me it was a sloppy, arrogant, unfocussed period for the company where I was losing interest and confidence in them. Nintendo seem much more confident and in control now and I prefer that more competent feel. I pay money to Nintendo and have done for nearly 30 years for games, not to see the execs behind the company's struggles and anti-consumer practices messing around trying to hide that they don't have many games. As I say, I suspect I'm in the minority on here so if anybody will be accused of trolling it will be me. One in the eye for Pokémon, Smash, 2D Mario and Animal Crossing, there. I hope they don't take it too personally. Hey! Somebody removed my wonderfully snappy comeback to the grammar king! My only concern is this guy actually knowing what has and hasn't been announced yet. Pikmin 4 has never really been officially announced but it's been nearly complete for 2 years and was mentioned at E3 last year as still being in development, Pokemon on Switch was kind of sort of announced that they were working on a game but it hasn't been given a title yet. He probably does know about Metroid Prime so I'll give him that one but if they told him they were showing and dating it at E3 he may be thinking of that as well. SSB was announced but he probably forgot that one. But it would still be an outstanding 2018 even if we only got games we already knew about - Pikmin 4, Pokemon, MP and SSB, Sept, Oct, Nov, Dec. That would sell consoles and we really wouldn't need any other games this year. Any other games he might know about that hasn't been spoken about yet, I think an Animal Crossing game is a given considering Switch is their new console now, and Mario Maker 2 considering how well the first game did. And I think we all expect a new game or 2 announced at E3 anyway for the holiday, so there's that. I believe this guy does have more info than we do though, he isn't just guessing, he knows. @electrolite77 On the era, we can somewhat agree, but he made clear it was the people and their presence he misses. And come on man, who the heck doesn't miss Iwata-san? He was a great, inspiring and amicable person, that really encompassed all fields in the industry, and he was passionate about all of them, and it showed. @ThanosReXXX You should post it again just to see if it got deleted by accident. Oh, and the needlessly adjective for negative is needless and subjective. Anybody who's been here through the past 6 years can always find reason to be negative, it's been a horror-show at times. Better now though, but I'm not convinced it's all better now. Yes - Startropics 3, please ! @electrolite77 I don't miss how confused Nintendo were. They were kind of like a dysfunctional friend. It's their friendly presence which i miss. They are a great efficient company now, but their communication feels more like a half hearted attempt to carry on what Iwata started "oh well the fans expect this now so we should probably try and carry on the directs and give Nintendo a face". It's just the feeling I get, but it feels forced. You mean needlessly lovely people. I love this community sometimes. If i remembered, during Satoru Iwata as Nintendo president, he wanted Nintendo games that care about Girl consumers also. This website is kind of like a dysfunctional extended family. @10-zx Who says video games can't bring people together! As for the adjective: nope, it definitely wasn't unnecessary. People ARE being unnecessarily negative. The Switch is doing great, selling like hot cakes, and support for the system is literally growing by the day, and not just with indies, but also with bigger triple A titles. That some people are still so desperate to find something bad in that, so they can exercise their "right to complain", is not only short-sighted, but also egotistical and pathetic. And of course it's not ALL better right now, but it is definitely getting there. @Anti-Matter No offense, but I don't get what you're trying to say to me. @ThanosReXXX "are still so desperate to find something bad in that"
There in lies your problem, you assume people are desperately seeking Susan, but for some people negativity is self evident, like seeing dead people. Cant' fault people for seeing what they see and who they are. Best just to ignore them. But what if they're needlessly negatively lovely people? What then? The Switch allready has a strong library of games I'm looking forward to, Tropical Freeze, Hyrule Warriors, Runbow, Daitoshokan, Mario Tennis, SNK Heroines, Song of memories, Steins Gate. Thats just ones I took out of my head right now. Will be interested in seeing what unannounced games he is talkibg about. And hopefully Japan will get a Switch version of Love plus. I remembered during NDS & Wii era, still with Satoru Iwata as Nintendo president, there were Soooo Many Games that targeted for Girls, Female Audiences. Not just only from Nintendo, but also from 3rd party (Both Japanese & Western developers). Let's say Girlie games like Cooking Mama, Style Savvy, Imagine series by Ubisoft, Charming Girl Club by EA, My Sims by EA, Dreamer series, Let's Play series, Nicola Kanshu, America's Next Top Model and other Cute girlie games. But during 3DS & Wii U era (Also after Tatsumi Kimishima as Nintendo president), the games for Female audiences started to faded away. Well, kinda disappointing but the new ideas must goes on. At the same, games like that will hardly / Never impress Male audiences, but it worked for me quite well. Sometimes in my thought, why don't create more games that dedicated to Female audiences again like during NDS / Wii era. I know some of them are Cheesy / Cheap, but at least there are some audiences who expected games like that. "Cant' fault people for seeing what they see and who they are. Best just to ignore them." These are some wise words, like common sense, so easily forgotten. People knows I am not keen on Wii U remasters so for me only Smash looks interesting right now. And Metroid Prime/Bayo 3 if they come this year. Hoping for some E3 surprises. I love that somebody outwith Nintendo but within the industry is showing such a positive reaction to Switch. With the exception of the SNES I have owed every Nintendo system and love their games, but the fact that we are seeing so much support from others is fantastic. I absolutely agree that we will be seeing further positives this year and personally can’t wait. I have two games pre-ordered and I also had the switch itself and Zelda pre-ordered, as much as I have always played games I don’t think I have ever been this eager to be buying at release, I think that says a lot about the quality and types of games we are seeing produced for and ported to the switch, long may it continue! @10-zx In my experience, it can't be AND, so it's EITHER/OR. @Anti-Matter I still don't understand you. I think you somehow thought that I was being negative about Iwata, but I wasn't. I miss Iwata, and I also CLEARLY said so, and that is why your comments made no sense to me, sorry. Well, he is a CEO of a "video game retailer", I am sure he has a list of what is coming, probably not allow to leak the informations till they get the "OK" sign? E3 we might (hopefully) see announcement of Pokemon (end 2018), Shin Megami Tensei V (2019), Animal Crossing (2019), Snack World Gold coming to the West ( 2019 ). Hopefully Tokyo Mirage Sessions #FE (wiiU port).... idk, so many games I hope will come to Switch but so little time to play them, lol! @ThanosReXXX I didn't mean you assume they are negative people, that's usually pretty self evident, negativity is pretty hard to hide, like how it's easy for our universe Kirk to play a bad Kirk in the mirror universe, but hard if not impossible for the mirror universe Kirk to play good in our universe - just that they were "desperate" to find something bad. Some people are going to dig through the good news until they find something bad to latch onto, but for some people that bad news is readily apparent, it's the good news they find hard to accept and believe. Of course anybody attacking you is probably just a troll. Negative people know they are negative, they don't need to attack people to prove it, they are usually only defending themselves. If they are attacking people then there more likely to be the trolls stirring things up and looking for bad stuff to pint out. The hard part is distinguishing between the 2. @sinalefa Forgot all about B3, thanks for the reminder. I don't see any chance of that coming out in 2018, doubt you do either, early 2019 would be nice though. The title of this article is misleading or you most likely misread his comments [Nintendo Life]. I'm pretty sure he's saying what we all are, "not everything has been announced yet, they got good stuff already on the calendar and with e3 around the corner I THINK we're going to see even more titles drive big sales." If we get Fire Emblem, Pokemon and Animal Crossing I couldn’t ask for more. I really hope they release a proper Animal Crossing game on Switch. I'm so sick of Pocket Camp. The fetch requests are boring and the constant barrage of events (some happening at the same time as others) is just too much. Also, I don't know what Nintendo did to it but the game is terrible on LTE now. I've reset my network settings and changed my iPhone X to only data accessing the LTE band. And it's helped for apps like Pokémon GO and Fire Emblem which run flawlessly now. But Pocket Camp still gives me a barrage of "move to a place with better connection" even though I'm at full bars of LTE and I'm on the top floor next to a window....there's no obstruction to my signal and it's just Pocket Camp that does this. So yeah, done with that game and I want a FULL Animal Crossing experience on Switch now! As Reggie says, "my body is ready!" I remembered Satoru Iwata was also care with Female audiences by providing A lot of Girlie games for NDS & Wii. Actually it was very Nice idea. He still care about female gamers. For me as a Male gamer, to see A lot of Girlie games on NDS & Wii, that was changing my perception about games genre. Also, for me as a gamer who tends to play Mild games with cute looking, the existence of games like that was like Oasis in the desert. There were a lot of games can be chosen. I didn't mean i was negative with your latest comment. I just want to share my thought back when during NDS & Wii era, when Satoru Iwata as Nintendo president. At the same time, i also remembered his policy to encourage 3rd party developers to create games that dedicated for Female audiences. That was a Nice idea. @rjejr Yeah, I know. My annoyance at them kind of got the better of me, and sort of influenced my comment to you. My bad, no offense meant. The thing is, I'm no gullible, believe-all positivist, I'm just a realist and a glass half full person, and for the life of me, I just can't understand that way of thinking, there's no gain, nothing to win, only a possible confirmation of your own negative thoughts, much like a self-fulfilling prophecy. It's stupefying to me, that when good or great news is announced, these kinds of individuals are somehow still capable of filtering all that out and only focus on the potentially negative thing that it might contain. The Wolfenstein 2 footage is another great but sad example of that. I downloaded it and watched it on my phone AND on my big screen TV, and knowing full well that YouTube videos are inherently lower in quality than the original, uploaded material (so you ALWAYS need to take that into account when judging the footage), it STILL looked sharp, clean and there were no major frame rate hiccups. Panic Button is truly doing a wonderful job porting this game to the Switch. I would think that Nintendo has shared information, even if it is just at an abstract level, with its prominent retail partners. And while there are plenty of reasons to not be critical of Gamestop as a corporate entity, it is one of those partners. It is also interesting that store clerks at its stores that talked down the WiiU and even the Wii are now enthralled by the Switch and are even pushing it. @Anti-Matter Ah okay. Well, in that case, no offense taken, then. But it certainly was a bit hard to understand why you said these things to me, as if I was somehow saying negative stuff. That is how it came across, so perhaps you could have started the comment with saying: "here are my thoughts about Iwata". @thesilverbrick I assume they likely will. Especially with Smash Bros already confirmed for 2018 despite not having a specific date yet. But I've weirdly gotten the feeling that, yeah, a lot of surprises might be had at E3. And being a CEO of a retail company, who benefits from knowing in advances about titles coming to a console to know what their store brand should order and how much, he indeed might have more informations than a lot of game medias. But even then, a lot of gaming companies seem to work on a "Fiscal year" basis. So while I felt early 2018 has been very bare for now.... someone was reminding me recently that "Fiscal year 2017" only ended in.... March 2018. I think it might be showing because when you just look at confirmed stuff for the upcoming month, you can already see Dark Souls Remastered releasing in May next month(whilst Owlboy gets it's first retail version)... there's Ys VIII and Mario Tennis Aces in June. And finally in July you'll be seeing Octopath Travellers releasing(whereas, iirc, Square Enix already has stuff like The World Ends With You's remaster confirmed for May-June iirc). Edit: I'm not super fond of Gamestop, but they are(and with their subsidiaries "EB Games" here in Canada) some of the largest video games retailers out there which does mean they have some clout/access to infos simple games journalists likely won't have access to. And they have likely seen that the Switch is right now a money printing machine still, unlike the Wii U which never achieved any such status while other consoles are still dragging the same generation of consoles with uncertainties as to what kind of successors they will announces or when.... the fact their latest announcements were basically "pro"/"stronger" version of existing consoles makes me wonder if they're trying to stretch the current generation due to uncertainties about how to figure the next console generation transition....... though E3 might still houses surprises for us. But to see folks like Gamestop's own CEO vouch for stuff like the Switch itself has me feeling that there's a shift of attitude/etc happening right now because retailers of all people were the ones pushing the most the "traditional high horsepower consoles" trend of the last couple of generations I feel. Like... even when the Wii was selling tons, I didn't feel like there was comparable support from both executives and retail clerks. Then what if they're needlessly negative while simultaneously being either/or lovely people? From Nintendo, a new Fire Emblem and Metroid Prime 4 would be enough for me. -Whatever has yet to be announced at E3. If anything, I think that 2018 is looking even better than 2017! Third parties are starting to ramp up support, Nintendo is releasing games at a rate of one big game every 1-3 months, and the eshop is filling in the rest. @Nincompoop "Super Mario, Mario Kart and Zelda were released in the first year. The rest of the remaining Switch years can never compete with the first year. The 3 biggest Nintendo games were already out." Not actually...yes with Mario Kart but no with the others. For us in this community those are the big guns, but outside of us, Animal Crossing is a MUCH bigger seller than Zelda. New Leaf has sold 11.5 million units. Zelda's highest ever was almost 9 million. Most seem to chart around 3-5 million. I do expect Zelda to beat that number though. "New Super Mario Bros" games and Pokemon games CRUSH Zelda and Mario Kart numbers and past open world Mario games (12 and 5.5 million for 64 & Sunshine). Smash on Wii was at over 13 million, so even that should beat Odyssey. What I'm saying is, if industry buzz is what's selling this system, meaning us geeking on open world Zelda's and Mario's is significant to sales, BUT the biggest sales franchises haven't hit yet. Anybody want to go in on some powerball tickets? 2018 has been boring so far. And if all we have to look forward to is Smash as our big Holiday game, than 2018 will be a failure. Pretty obvious PR speak, but one thing is clear: A lot of great titles are already waiting for me on the Switch. I would really love Prime 4 this year! He knows nothing, and GameStop is trash. Do not support GameStop. Switch had the best first year of any console since a long time, surely not from quantity but definitely from quality and of course there are coming even more top games this year. Actually he likely does have visibility. If not entirely on specific titles, surely on intended support. In the US major game retailers like GS and BB have pretty close connections to major publishers. So they probably have reps from the majors saying we plan to release X amount of Switch games this year. Animal Crossing could be coming to Switch this year, given that the Animal website is being rebooted. If Super Smash Bros, Animal Crossing , and a core Pokemon are all released on Switch in Q3/Q4 2018, alongside Fire Emblem, Yoshi, and a handful of 3rd party titles, then 2018 will be massive for Nintendo. I learned ages ago - to buy Nintendo hardware means you need a PS or PC so you have AAA games to play while waiting months for the "Unannounced Titles"
@BanjoPickles you are discrediting people saying its bare with assumptions that haven't been confirmed? I used "if" because yes, it seems unlikely yet not impossible. I want the Splatoon 2 expansion too. That's going to be $20 DLC only thought right? Not like Gamestop needs shelf space for it. If it was a $20 stand alone disc like the Luigi Levels were for NSMBU I'd be more interested as I'm nto getting the full game. @TidusUK I don’t. Even the Wii U got more than four first-party games a year. Nintendo’s own games are the primary reason people buy their consoles and they should come out at least bi-monthly, not quarterly, especially since 3DS development is all but done (everything on 3DS from here on out is a port or remake). Hey, no need to talk trash like that in front of me. You can hate SquareEnix, Capcom for their attitudes, but don't express your hatred to me. @Oat I stand corrected, though Sushi Strikers is a last-minute port of a 3DS game. @Anti-Matter It wasn't my intention to be disrespectful towards you. It is just that I don't trust third parties with a clear Sony bais. Is he just speculating, or do game companies actually tell retailers like Game Stop about games well before their public announcements? I heard a rumor that Nintendo was overhauling their Animal Crossing site - Animal Crossing Switch is certainly a possibility. Nintendo could shock us all with Pokemon Switch and Fire Emblem Switch before the year is out. If we are talking March - March - which is the year for the Switch, we might see Metroid Prime 4 before March next year. Though I think it unlikely, getting those 4 games on the Switch would see crazy sales. Pokemon alone is a major console mover. Of course my wishes could be over-riding realistic speculation at this point. Yes, DLC only but it would be cool if it was standalone. Hope he knows what he's talking about. Nintendo insiders hinted at strong 3d party support for late 2018/2019 so my hope is there.Diablo 3 and GTA V? Gamestop is the biggest video game retailer in America. Of course they are privy to insider knowledge. I'm fairly certain they regularly hold business meetings with publishers and the 3 platform holders about upcoming software (and hardware) releases, including unannounced titles. My Switch already has too many games on it - I'm struggling to find the time to play them all. @BanjoPickles I agree and disagree. I think so far it's pretty dull, but just for the people who own a Wii U. I like that there are ports coming to the Switch. Hyrule Warriors en DK:TF are both brilliant games and makes the library from the Switch even better. But for example, South Park is already released on all platforms, except Switch. Never too late, ofcourse, but it's not that exciting. For Pokémon and Metroid P4: we know nothing about them. Gotta wait for E3 to see what this year will bring, and probably a direct in somewhere September. It's like nintendo got so excited about 2017 that they forgot 2018 was going to happen. Theres some people, especially commenting here, that will never be happy. 2017 was a really good year for Switch. 2018 has already been just as good, and for me, better. It only goes up from here too. But I dont just play first party titles, and I never had a Wii U, so my opinion comes from there. I also own other systems, though I rarely touch them now. I'm gonna be that guy again but I don't really miss him. He was an industry exec I didn't know. I can only judge him off what happened to Nintendo while he was in charge, a lot of which I didn't like. I don't want to go into my litany of criticisms as it could take a while. I do give him a lot of credit for things, not least setting Nintendo onto a better course with the Switch. But I also don't miss the 'humour' we used to get on Directs. Reminded me of Christmas parties in my old job where the board would do some self-indulgent skit we'd all have to sit and cringe through. It think there's a transition period where they're pushing new faces to the fore. But for me one of the most impressive things about Nintendo in the Switch era so far is how in control of their messaging they are. The pacing of their announcements has been pretty much spot on, as has the marketing itself. I'm amused that you and others think the CEO of the world's biggest games retailer doesn't know what Nintendo have planned. @electrolite77 Yeah they're definitely much stronger as a business now. That's OK then. Nintendo have Kirby, Labo, Sushi Strikers and Mario Tennis in the first half of the year, along with three ports, one of which has significant enhancements. Not much to my personal taste but bang on schedule. And as a bonus, third-party support. I'm guessing the VGChartz figures don't include digital, and certainly won't cover used game sales and rentals (are rentals still a thing?). Regardless even assuming as many as 5m Wii U owners played DK and/or Captain Toad, that's not even 25% of the present Switch user base. Nobody is making previous owners buy these ports, but please stop treating them as an insult. Trencent please bring Ring of Elysium to switch ASAP!! @ThanosReXXX With regards to the broken record negativity brigade, as someone else said in here recently, videogames are forms of entertainment, crying over them is such a ridiculous first world problem. If videogames cause them so much stress then the rest of their life must be so blessed. These people really need other things going on in their lives. @LUIGITORNADO I think you might be speaking for yourself again there mate. I've got plenty of stuff I want to buy. I'm hoping for Mario Maker 2, Metroid Prime 4, Civilization, Fortnite, NHL19, and some Wii-ports. If by some miracle Nintendo can release Smash, Fire Emblem Metroid and Pokémon by years end then yes, I would say 2018 would be a system selling year. Smash and Fire Emblem seem likes a sure thing at this point. As for Metroid and Pokémon, even if they don't make 2018, a good look at them at E3 would certainly help drive interest in the system. And then there is whatever Retro Studios has been busy with and the probably E3 surprise from Nintendo and third parties and 2018 could be another great year for Switch. The first few months of 2018 have been a bit lean so far though. @electrolite77 Fair enough. For perspective, though: obviously, none of us really 'knew' him, and for me, it was not about his humor, but more about the things he said, the ideas he had and where they came from. There are so many people who are just either/or, and he was still so enthusiastic about so many things, almost all the time, and I found that to be infectious, in a positive way. And that is completely besides whether or not the things he did/some of the things he did, were actually good or not. Making mistakes is part of taking risks, and risks are what they took on their path to renewed success. As a sales & marketing man, I can definitely relate to that. And remember: the Switch is still VERY much Iwata's idea and legacy, so even for that alone, he needs to be respected or could at the very least get some credit. Not much 1080 love in this thread. Sad days. Top down racers are fun and all but we need some proper competitive racers on Switch like Wave Race, F-zero, F1 etc to complement the available software library. Oh well back to rocket league and the rest of my massive backlog. Iwata deserves a lot of credit not just for the Switch (as I mentioned earlier) but for the DS which was brilliant, the Wii (for a while) and the 3DS which is solid if uninspired and coped well with the rise of Mobile gaming. The Directs are great and the move to a digital presentation at E3 has been vindicated. He took risks which is to be praised. By the same token being a 'gamer' didn't help him see the potential in Online gaming, or stop him parking series like F-Zero or stop him pursuing a slew of anti-consumer (i.e. anti-gamer) practices. Even while taking risks Nintendo still managed to be a remarkably conservative company, for better and for worse. And how they made such a mess of the transition from DS/Wii to 3DS/Wii U (by not preparing for HD development) will remain a case study up there with the fall of Atari and mid-90s Sega. Now I accept that are probably intangible benefits to his enthusiasm. I don't know what games he helped inspire and encourage with that, I can only go off what I knew which is while being presented as something different he was a profit-driven CEO who wasn't consistently good at it. Praise and criticism where it's due, basically. @SomeWriter13 This was my guess! It makes sense! It's getting very hard for me to believe anything these companies say any more really about anything. Our boy Jax keeps giving me a hard time about not buying XC2 as I wait for the $30 DLC to release b/c he says, correctly, that Nintendo doesn't do "complete editions". But up until last year I'd never seen anything like Zelda BotW Explorer's Ed or this year "Splatoon 2 Starter Ed" either. And then of course there is MK8DX and Pokken DX. And HW:Definitive, which I suppose is much better than "Complete", though I suppose that means we got "Unfinitive" edition on Wii U. Just what is the opposite of Definitive anyway? So, as always, I wait. Still waiting on my library to stock Switch games. They have three 3DS games so I figure it's only a matter of time. I have Minecraft Wii U and Batman PSVR out now. tldr "Splatoon 2 Starter Ed" leads me to believe "Splatoon 2 Complete" later. I'll pay $60 for a year old game if it includes the $20 DLC. Then I'll play the single player and trade it in. @ThanosReXXX I find I'm getting pretty good at ignoring almost everybody these days, and they're ignoring me too so that works out well. I don't think anybody can take me seriously w/ my singing frog avatar anyway. I think most people will come around eventually, maybe after E3. Has to be better than that 10 minute Nindie Direct, it's stuff like that that keeps people guarded about Ntinedo turning it around after the Wii U disaster. For all the positives there are still a lot of negatives to overcome. Switch has been out for over a year now, MyNintneod even longer, but for everyone earning gold coins on Switch game purchases they have nothing to spend them on, not even a theme or background, for the Switch. MyNintneod is so much worse than Club Nintneod ever was, at least here in the US. Switch is doing so well, there are 500 indie games on it, make 1 or too available on MyNintnedo, or 10% off 1 2 Switch. SOMETHING. There is no Switch category at all, they even took away the box that said "Switch Rewards Coming Soon. Using gold coins for 1 penny each is insulting. @rjejr After E3? You mean like last time, when almost every sigh coming from Nintendo was criticized, and the glee/joy about Zelda BotW winning almost every prize out there dropped off a cliff again already after several days? MyNintendo is crap, though, so wholeheartedly agreed on that. I have never been so dissatisfied with a service as that. Although, truth be told, I'm even more dissatisfied in general about Nintendo's disgraceful behavior regarding collected points becoming invalid/removed after a certain point in time. And that has already been an annoyance of mine ever since the previous service, when they ripped out almost 3800 points from my Stars Catalog account. Points that I had collected over many, many months/years, with my own, hard-earned money. @ThanosReXXX "Nintendo fans are the most critical/hard to please"
I'll agree with you there. I think Sony fans have so much going on all of the 4 generations of home consoles only Vita people get upset but the PS owners just drowned them out and tell them to buy a real console. And MS fans just seem to be happy w/ GoW, Halo and Forza, so starved for games they are. Thing is, I think it's the western Nintneod fans that just don't meet eye to eye w/ Nintnedo business decisions or practices, handheld owners in Japan seem to buy tons of Nintendo products, even Yokai Watch and Taiko drum simulation games. Western audiences really shouldn't even be buying Ntinedo consoles, Ninty should just keep to themselves in Japan, kind of like how MS keeps to the good ole' boy US of A. But yeah, E3 should be good. I'm counting on it anyway. Labo is only going to get them so far w/ their fan base. And some people will always complain, I'm talking more about the overall feel. Like when MArio Tennis U had exactly 1 court and no motion, AC:aF was a thing, and Metroid Prime: FF didn't have Samus as a playabel character. Oh and SF:Z was barely a remastered N64 game graphically and it was still delayed for months as they forced motion and a 2nd screen onto the Gamepad. It wasn't just that the Wii U sold poorly and didn't get any 3rd party support, it's that the 1st party support sucked big time as well. Everyone was upset back then. Well 95% anyway. Going to take awhile to turn that 5-95 around to 95-5. It will never get to 100-0 either way. E3 does need Pikmin 4, and SSB needs to look like a new enough of a game even if it is a port. And less ports, more new games going forward. SMM 2, not SMM:D. But I have a good feeling. @ThanosReXXX "so even if I complain"
We'll I'm sure you'll be complaining about all of the other people complaining about their hobby. Seriously though, I'm looking forward to a good E3. Of course I'm also looking forward to Labo so there goes all my street cred. I know Nintendo hasn’t said much, but they have a shareholder call coming up in a few weeks, and there is a real possibility they are waiting for that. Remember, we first heard of NX on one of these. Smash is going to help, but I’m betting there is at least one more big game before the end of the year.